Bodhi News & Analysis - Secularism debate | Informal to formal in India | Women in workforce - 22 Mar. Welcome to Bodhi News for 22 March, 2017 - from Bodhi Booster knowledge portal! 1. Bodhi Saar (Video) + 2. Highlights + 3. Bodhi Resources link + 4. Downloadable PDF free! 7. Constitution and law – In a big blow to the Mamata Banerjee government, the Supreme Court upheld the Calcutta High Court’s decision to order a preliminary CBI enquiry into the Narada Sting tapes allegedly showing TMC members accepting bribes. 8. World politics, terrorism – The Trump administration hosted foreign ministers from 68 countries in the first meeting of anti-Islamic State coalition to agree on the next steps to defeat the Islamic State (IS). 9. World politics – Afghan Foreign Minister Salahuddin Rabbani said in Washington that terror groups continue to have safe havens in Pakistan, and accused Pakistan for destabilizing his war-torn country. He further said that a paradigm shift was needed in Pakistan to bring Taliban on the peace table. Welcome to the complete collection of all Open Videos of Bodhi Booster knowledge portal! Spread the good word about Bodhi Booster! Join our social media family using links provided on top right of all pages. Share this using the yellow vertical bar icons on right side of your screen. Comment and let us know your views in the Disqus threads. Use हिंदी बोधि and English Bodhis for knowledge development beyond mere exams. Learn English in an easy, spontaneous and practical way - welcome to Bodhi Bhasha. For exams revision, go to Bodhi Revision. 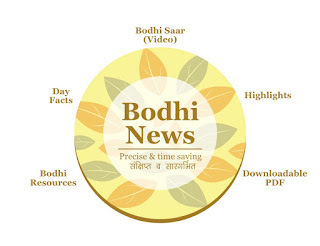 Stay ahead with precise and time-saving news and analysis videos, Shrutis and PDFs by Bodhi News! Use content and expertise of our friends at PT education for competitive exams prep - check their PT Youtube channel, PT site and PT Self-prep courses that help you prepare best right at home! Bodhi News: Bodhi News & Analysis - Secularism debate | Informal to formal in India | Women in workforce - 22 Mar.